The heat clings like an extended sigh to my limbs, despite the early hour of the morning. The stiff breeze has transformed the surface of the water into a ruffled expanse of wavelets. My arms feel heavy, as I pull the surf-ski forward into the sepia coloured morning. The city hides coyly, like a young bride, behind a veil of dust. Skeletal fragments of buildings appear and disappear, while the hum of the city softens into a whisper. We stay on a course between Lulu Island and the Corniche, but do not venture far, before heading for a beach on the island for a much needed break. It is hard work to battle against a sandstorm that, not only weighs heavily on the body, but also the soul. It is much easier to bob listlessly in the tepid water, staring at the vague outline of the sun, and talk about our upcoming trip. When our fingers and toes turn into prunes, and our nostrils sting with the smell of the desert, we head back, straight into the wind. It feels like we are suspended in time without any forward momentum. But every now and then, for a brief moment, I can relax from the constant battle to stay upright, as the wind that funnels through the open gaps between clumps of buildings, gives me a break. It is short-lived, but appreciated, as we zig-zag back to where we started. The morning is silent, except for the rhythmic splash of water, as our paddles plunge in and out of the mirror-like water. I shiver every time stray drops find their way onto my exposed skin. The air is crisp at sunrise on a mid-winter’s morning. It smells of mystery and adventure. And with the city engulfed in a thick fog that has rendered it eerie and quiet, we head out towards the open ocean, before turning right to hug the outside of the breakwater wall. The world has disappeared, except for the dark grey outline of the breakwater wall slithering into a cocoon of fog. My movements feel fluid and effortless, and I can turn my attention to the narrow slit I glide through, with ease. I peer through the translucent water towards the sandy bottom, and tilt my head upwards to peer at a bright blue patch of sky that hovers for a fleeting moment above me, before turning inwards. I fill my lungs with the wetness of the morning, and marvel at the intensity of the colour of the neon green algae glistening on the smooth boulders at the water’s edge. It feels like I am gliding through a frozen zen-like picture, but as we turn back towards where we’ve started, and round the corner of the breakwater, the city slowly re-emerges, and life resumes as usual. The morning turns mild, as the rays of the sun burn the fog away, but the water stays icy and uninviting, as I drag my kayak onto the beach. The sunlight bounces off the soft blue hue of the water. Around us people crowd jet skis and powerboats. We float noiselessly amongst the roar of engines, and turn sharply into the wake they leave behind. At the end of an early summer’s day, people flock to the water to enjoy its soothing coolness. We welcome the breeze that caresses our sun-drenched skin, and take long sips of water from our camelbacks, where the last of the ice cubes rhythmically melts away with every movement we make. Circling lazily around the bay, we are in no hurry to go anywhere. Just being outside on the water is enough to fill our hearts with joy. Later, when we bob weightless in the briny water that folds like a ribbon of silk around our bodies, we only stir, when the last notes of the call to prayer fade into the soft pink of the evening sky, and the tantalizing aromas of food from a nearby restaurant, urges our stomachs to head home. 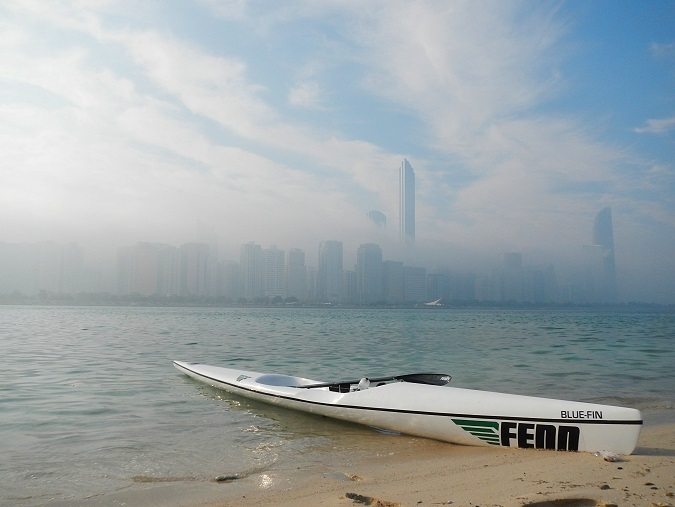 # Living in Abu Dhabi gives us access to soul-soothing water, which, no matter the weather, always heighten our senses. In mid-summer it is one of the only places pleasant enough to spend time outside air-conditioned spaces, even when the temperature at 7.30 am is somewhere between 36°C and 40°C. # Winter mornings drop to around 15°C, and although warm compared to most other countries, it feels rather cold for us, as we are far better adapted to the heat, after having lived here for so long. # I am not a water baby, and would never have tried surf-skiing / kayaking, if it wasn’t for my husband. I have come to love our time on the water, regardless of the weather. I haven’t done much kayaking, but I’ve always enjoyed it. Your photos tempt me, but not during our Australian winter. Last night was -7°C. For the heat, that is far to much for me. But your blogpost reads like a poem. Up here we seem to be looking forward to a temperature into the same directions. Maybe I should start kayaking? I truly appreciate not just what you write about but the prose you use. Thank you for the lovely compliment, Francis. So do I! 🙂 Thank goodness we do not kayak in your dream. I love the images you have with this post. I have a friend who lives out there, and they love to do paddle boarding. I had to look it up because I had no idea what it was. It’s funny though to think of water + the Middle East. But your description of being out there on the water – perfection! Makes me want to go out and be all literary. Hahahha. Beautifully written! Haha! Thanks, Lani. Yip, water, somehow never comes to mind, when thinking of a desert country. Your descriptive prose transported me into a zen-like state, too, Jolandi, and made me glide through the crystal-clear water right next to you. Thank you. Thank you, Tanja. I love how my thoughts wander, when I’m out on the water, and this post really is a reflection of what happens inside my head during those paddling sessions. I love kayaking, specially for that feeling of floating in space that you captured so well. ” The world has disappeared,” is exactly how it seems. 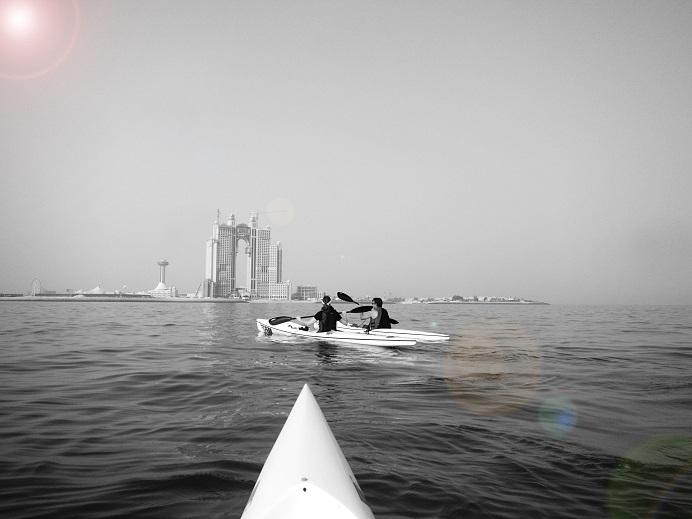 I had no idea one could kayak in Abu Dhabi. I always think of the desert in association with that city. I know! Yet, Abu Dhabi is surrounded by water. Bobbing around in the water, once, after a paddling session, I told my husband that if one squints to block out the high rises, one could easily imagine to be on a tropical island, as the water was so clear, and the sand so white. Your first sentence takes me in on the ride, “The heat clings like an extended sigh to my limbs, despite the early hour of the morning” ~ even then, I’m left wondering what the heat must feel like in Abu Dhabi. 🙂 I’m a huge water person, and kayaking is one of those things that can take you into another world, and you describe it well. Just beautiful. I can feel what you experienced.